If you’ve ever been to the eye doctor’s office, chances are you’ve seen an autorefractor keratometer and didn’t even realize it. These devices are highly useful and though they have a slightly complicated name, their function is actually quite practical. So, what do these things do, exactly? Let’s break it down. For starters, an autorefractor is a machine that can measure your prescription for glasses or contact lenses. It also parses out the refractive error. It works by shining light onto your eye and measuring how the light changes when it bounces back. What makes this such a popular machine is that it’s fast to use and causes the patient absolutely no pain or discomfort. As far as the patient is concerned, they’re just looking into a machine at a picture. This picture changes focus and the machine takes a variety of measurements to calculate when the image appears on the retina. After several measurements are taken, an average is calculated and the prescription is formed. This is a straightforward way to determine a prescription without the subjective element of asking a patient when he or she can see letters on a chart clearly, for instance. The keratometer is a machine that measures the cornea and its shape by shining light on it and measuring the reflection. It’s also used to diagnose numerous eye problems like astigmatism and other corneal issues, as well as to ensure a correct fit for contact lenses. What makes the autorefractor keratometer revolutionary is that it combines both of these machines into one easy-to-use device. This cuts down on error and on the length of time required for patient visits. In every way, this is a benefit to the eye care industry. Eye doctors can see more patients and reduce the amount of time spent on diagnostics while patients save time at their appointments. This also dramatically reduces patient wait times and can make the experience of going to the eye doctor much less stressful. While the autorefractor keratometer can’t replace all of the tests and procedures in an eye doctor’s office, it can streamline some of the processes. It also works to give doctors a place to start when determining a patient’s prescription. This starting point is combined with traditional vision tests to create a more accurate picture of what a person’s prescription should be. And anything that makes going to the eye doctor a little bit easier is worth it, right? 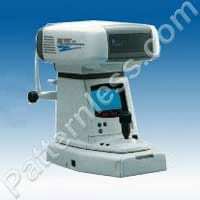 Previous PostPrevious Used ophthalmic equipment better value than buying new?